The debt ceiling deadlock is finally starting to rattle investors. During the first six days of the government shutdown, investors had a relatively blasé attitude toward the drama in Washington. But as a critical Oct. 17 deadline approaches, stocks continue to fall. 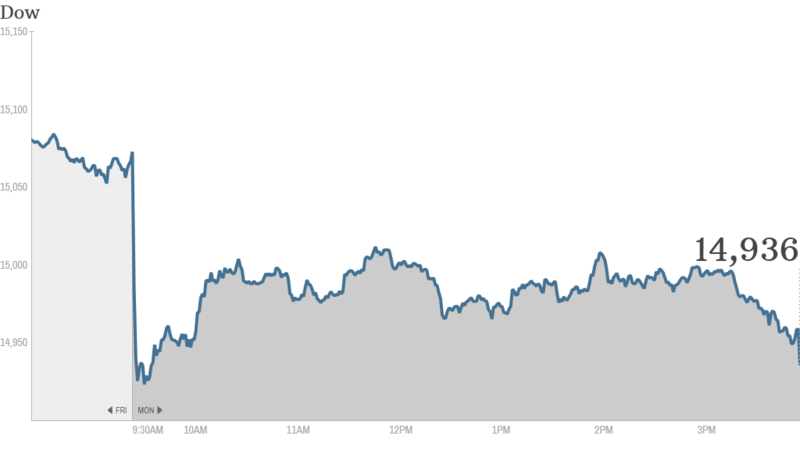 The Dow Jones industrial average, the S&P 500, and the Nasdaq closed down nearly 1% Monday. Congress waiting for a sell-off? Several analysts say that a sharp sell-off in stocks could be the one thing that pushes Congress to act swiftly. So far, stocks have been holding up pretty well..
"A resilient stock market and a cloudy economic picture increase the risk of an extended shutdown in our view," Bank of America analysts wrote in a report over the weekend. The government shutdown is in day 7, and lawmakers appear no closer to resolving the impasse. Sounding the alarm on the debt ceiling: Treasury Secretary Jack Lew said Sunday that Congress was "playing with fire," with the possibility of a U.S. default only a little over a week away. Deutsche Bank analyst David Bianco thinks the lack of a debt resolution will drag on the S&P 500 this week, but says there's little chance that the U.S. will default. However, if it does, Bianco says the S&P 500 could sink 45%. That echoes the sentiment of ETX Capital market strategist Ishaq Siddiqi, who said the debt ceiling debacle could lead to a "subsequent meltdown of global asset prices." Last week, Bank of America analysts said the government shutdown wouldn't impact fourth-quarter GDP growth. But over the weekend, they changed their tune and lowered growth estimates for the fourth quarter to a 2% annual rate from 2.5%. Earnings kick off this week: The first corporate results for the third quarter come out Tuesday, when aluminum maker Alcoa (AA) reports after the market close. Two of the biggest banks -- Dow component JPMorgan Chase (JPM)and Wells Fargo (WFC) -- report Friday morning. Bank stocks, including JPMorgan, Bank of America (BAC), Citigroup (C), and Goldman Sachs (GZPHF), dropped nearly 2%. Analysts fear that weak third-quarter earnings could also weigh on stock prices. What's moving: Shares of Apple (AAPL) rose after the iPhone maker was upgraded by Jefferies analyst Peter Misek. "$AAPL Haters be Damned, Peter Misek Has Been Great on Apple (AAPL) Target = $600 http://stks.co/alZL Bullish," StockTwits users TimZ wrote. Still with Apple down nearly 30% from its all-time highs hit in 2012, many investors are still skeptical. "$AAPL "It's Tough to Get Past the Idea That Tim Cook Has 'No Clue'" http://stks.co/blUN," wrote ValTheGal. Shares of BlackBerry (BBRY)gained nearly 4% on talk that new buyers are emerging for the troubled smartphone maker. The buyers, according to reports, could consider buying Blackberry in parts. That's giving investors at least some hope that a deal may actually get done. "$BBRY $BB.CA Financial Post: "BlackBerry survival seen in security not smartphones" http://stks.co/tVS7 Bullish," rgb66rgb wrote on StockTwits. But some traders noted that looking at BlackBerry is a far cry from buying it. "$BBRY Any Large corp looking for growth, will analyse the potential of any company, specially those with Billions in revenues," wrote i7up2001.